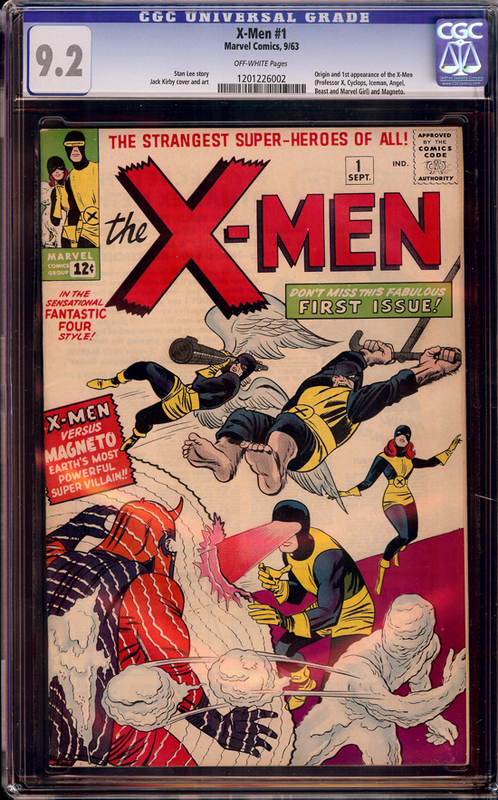 Featuring the origin and first appearance of the X-Men (Angel, Beast, Cyclops, Iceman and Marvel Girl) as well as the initial appearance of Professor X and Magneto, this early Marvel is a drop dead GORGEOUS NM-. It has a beautiful white cover, off-white pages, sharp edges and an impressive spine. The centering and cut are ABSOLUTELY PERFECT plus the staples are tight as a drum and EXACTLY situated on the spine edge!! With tremendous eye-appeal, this popular key will make a welcome addition to any high grade Marvel collection. There are only 17 copies in the world graded higher than this one; 12 9.4's, 3 9.6's and the Pacific Coast and Curator 9.8's. Most of these are in private collections and probably won't see the light of day too soon. A 9.2 is still very affordable (last public sale was for $48,468 from November, 2013 with the one before that at $62,140 in November, 2012). The last private sale was for $62,000 at the end of 2014.